March 18, 2016, 12:36 p.m.
It’s a common lament: Though the Internet provides us access to a nearly unlimited number of sources for news, most of us rarely venture beyond the same few sources or topics. And as news consumption shifts to our phones, people are using even fewer sources: On average, consumers access 1.52 trusted news sources on their phones, according to the 2015 Reuters Digital News Report, which studied news consumption across several countries. To try and diversify people’s perspectives on the news, Jigsaw — the tech incubator, formerly known as Google Ideas, that’s run by Google’s parent company Alphabet — this week launched Unfiltered.News, an experimental site that uses Google News data to show users what topics are being underreported or are popular in regions around the world. 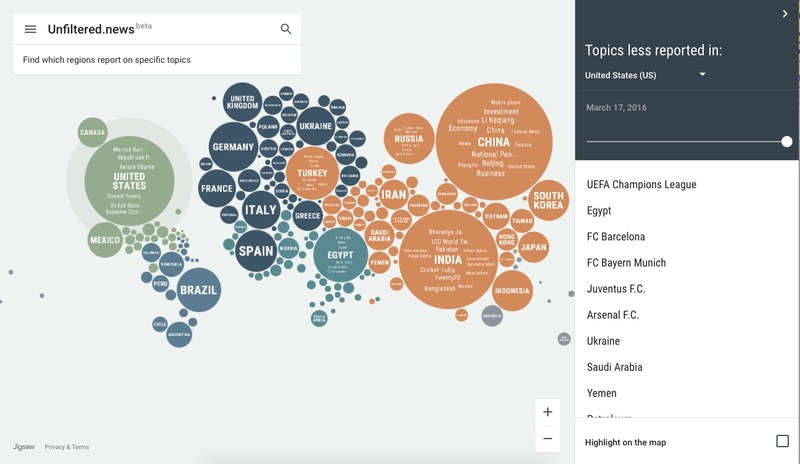 Unfiltered.News’ main data visualization shows which topics are most reported in countries around the world. A column on the right side of the page highlights stories that are being reported widely elsewhere in the world, but aren’t in the top 100 stories on Google News in the selected country. In the United States yesterday, five of the top 10 underreported topics, unsurprisingly, dealt with soccer. In China, Barack Obama was the most undercovered topic. Search engines, social media and news aggregators are great at surfacing information close to our interests, but they are limited by the set of topics and people we choose to follow. Even if we read multiple news sources every day, what we discover is defined by the languages we are able to read, and the topics that our sources decide to cover. Ultimately, these limitations create a “news bubble” that shapes our perspective and awareness of the world. We often miss out on the chance to connect and empathize with ideas beyond these boundaries. Unfiltered.News also lets users explore how certain topics are being covered around the world. Merrick Garland, who Obama named as his nominee for the U.S. Supreme Court on Tuesday, has been dominating coverage in the States. By clicking on his name in Unfiltered.News, users can explore how his nomination, and the Republican Party’s refusal to vote on it, have been covered everywhere from Germany to Guyana. The site features a timeline, so users can see how coverage of each topic has changed over time, and it also uses Google Translate to translate headlines into one of 40 different languages. Unfiltered.News is also soon planning on launching a weekly email that will send subscribers news that’s optimized for their region. The viz is still in beta, so there are many known limitations at the moment, including the fact that topics (like Zika Virus) don’t map to larger concepts (like health or virus), and in some cases headlines/translations may be missing. Currently we only show the top 100 topics per country, so there may be topics that are in the news on a given day, but are not represented on the map. Lichterman, Joseph. 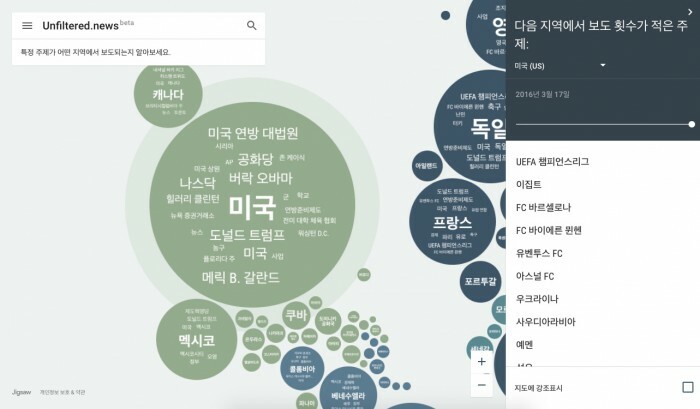 "A new data viz tool shows what stories are being undercovered in countries around the world." Nieman Journalism Lab. Nieman Foundation for Journalism at Harvard, 18 Mar. 2016. Web. 18 Apr. 2019. Lichterman, Joseph. "A new data viz tool shows what stories are being undercovered in countries around the world." Nieman Journalism Lab. Last modified March 18, 2016. 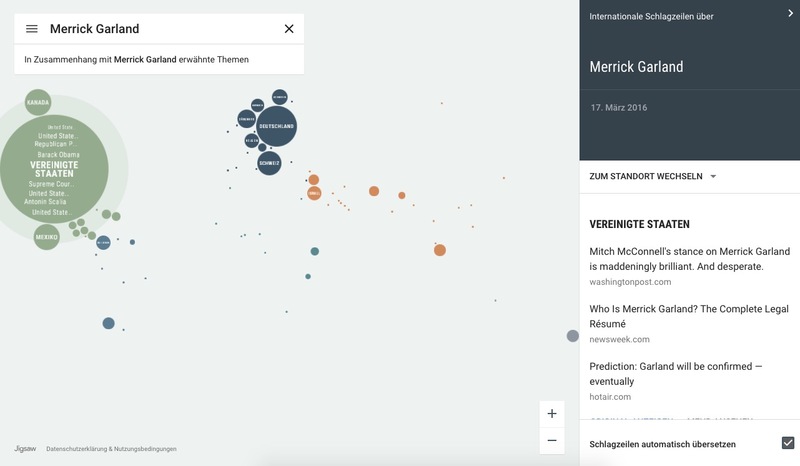 Accessed April 18, 2019. https://www.niemanlab.org/2016/03/a-new-data-viz-tool-shows-what-stories-are-being-undercovered-in-countries-around-the-world/.